We don't go out to eat a lot these days. Taking three kids under six to a restaurant is not really my idea of a good time. It's always chaotic. I inhale my food without tasting it. I'm always in a rush to leave before the inevitable meltdown. I'm usually pretty good at pre-packing activities to entertain my children at restaurants. But, there are many times we decide to go to dinner "spur of the moment." I don't have time to pack an activities bag and we wind up at the restaurant without any form of entertainment at all. Not too long ago my sister-in-law purchased small cloth bags for each of my kids. I wasn't sure what to do with them until one day, it hit me. I filled each bag with small, age-appropriate activities and stuck them in the trunk of the car. Keeping activity bags ready in the trunk at all times has been an absolute life-saver! We can bring the bags into restaurants and other places where the kids have to wait (like the doctor's office -- do you really want them touching the germ-laden abacus?). I even pack a small bag with baby toys and a bib for my one-year-old (because I am always forgetting to bring a bib). Some smaller type items that I have found work well include crayons, Matchbox cars, small puzzles/games, silly putty (my son's favorite), Brainquest cards and stickers. Every now and then, if I see something at the Dollar Store or the Target $1 section, I might swap out a few items and add a few new ones. I try to keep things interesting. But having it with me, has spared me many a public meltdown. 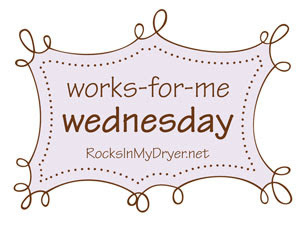 For more helpful tips and ideas, head on over to Works for Me Wednesday at Shannon's place! What great ideas! Thanks for sharing! Come on by Wani’s World sometime! I always keep a bag with colors and coloring books in the car, but I have never thought of putting little toys in there too...great idea! This is a great idea. Still, I long for the day I can go "bagless" to a restaurant. Just me and the hubby. No diaper bags, no sippy cups, no Star Wars sticker books, no "do you have nutritional information for your kids menu?" Sigh. That is a bright idea. I totally need to do that. oh totally!!! i do that too. i leave this large zip up tote with kids emergency toys, change of clothing, diapers, wipes, and even sometimes... snacks. all in each individual handy dandy zip lock bags. life saver for those spur of the moment things. Great idea! I am packing for vacation this week and know we will be out to eat while traveling...I am doing this one for sure! Great idea! We just had dinner out on Sunday, and I wish I had something like this along....the attention span of a two-year-old leaves a little to be desired. Great idea. Now that I'm past the diaper bag stage I really should do something like that. Once I stopped carrying the bag around the kids stopped having stuff all the time. It would also keep matchbox cars out of my purse! Fabulous idea! I do this too. It has saved many a meal and lots of my sanity. Maybe you already do this, but it would be fun to sneak the new items in, only to be discovered with glee at the meal! That is a great idea. I just saw cute little backpacks that I know the kids would love. Now, I have the perfect excuse to buy them and use them.